We have been out of town for the last eight days. I shot this photo in Pennsylvania and thought it fit this challenge. Enjoy! We were out of town for the Passover festival but are back now, so I’ll be around more. Studies are coming along. This is a good quarter thus far 🙂 Thanks for stopping by and for inquiring. I’ll be “roaming the blogs” again, soon. I love this photo – I have something in my cell membrane for the colors Yellow and Red! Thanks!! When ever I get a chance to visit the west I love spring time when flower are starting to come out again and display their lovely colors. Is that a red tulip in the center? Tulips do not grow here because of the hot weather. Most of the ones I see are in the refrigerators of florist shops. The yellow ones are dandelions, right? Nice capture! 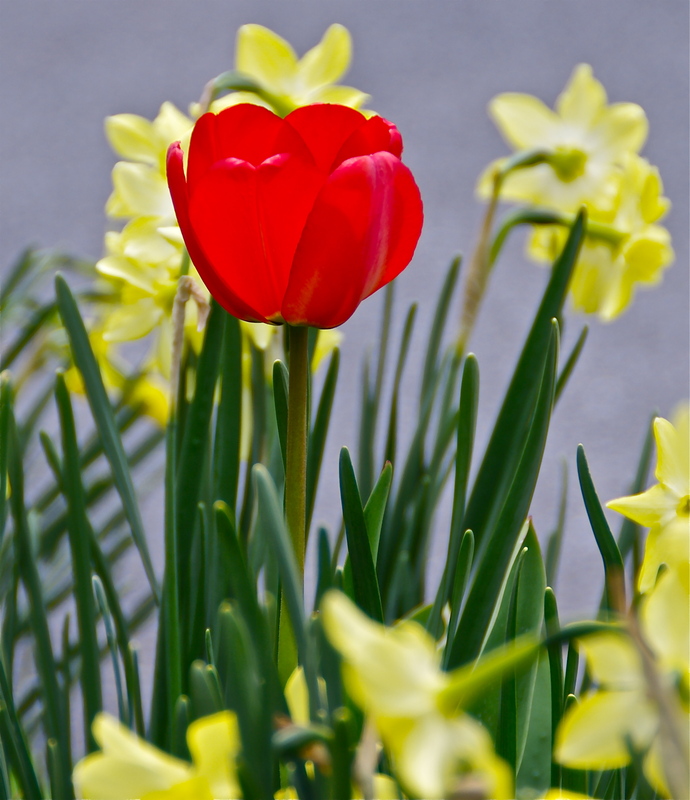 Yes, that is a lone red tulip among a sea of daffodils! I happened upon that garden quite by accident as I strolled through the neighborhood of some friends we visited last week. . .the tulip created a nice contrast. Glad you liked the photo, and thanks for leaving a comment.